NOTE: This isn't a new part of the map (the areas here are listed in the blanket of forest in the Field Zone, and the cliff in Desert Zone), but merely a few areas that are visited for the sole purpose of accessing the final dungeon. It's easier lumping them into one page! Theta is the last town you will see in the game. The Shop has a hammer for sale. Nothing else to the place. T.Forest has a Shop, found by pushing the block in the far corner. More importantly, the Karabon Champ lurks in the top-right corner, and challenges you to a Karabon fight, best two out of three (a draw counts as your loss). Win two rounds against him, and KameKing is yours. AccessPt is your gateway to Fantasy. Use Youni to dig away the dirt on the Medal slots, and enter the inner circle to be sent to Fantasy. 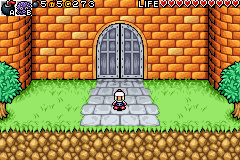 Use KameKing to open the door, and prepare for a long and tedious dungeon. [C6] Fantasy's entrance, warp to the other side and take out that Hige Hige bandit. [C5] Demolish the Nuus and the Nuu generator to open the door. [B5] Some sawblades to watch out for. [B4] That bomb switch will open the bottom door, while pushing the switch will open the top. [B3] Two flame spurters, a bullet statue and a conveyor belt. Blast open that left wall. [A3] In there, that top switch will disable the lower spikes, the bottom will disable the top, and the middle opens the door. [A4] Bomb the switches to disable the spikes, avoid the flame spurters and sawblade, and get the Small Medicine. [B2] Push the switch to open the door. [C2] Wipe out the three Crystal Demons to open the doors. [C1] Watch for the sawblades, and be wary of the arrows that shoot when you step on the switches. [D1] Toss a bomb to the switch to open the doors. Blast that top wall, and be careful of that arrow switch. [D0] Use Sibaloon to cross over the gaps and push that top block to open the door. [E0] The return of the spike blocks! Work your way through and use Sibaloon to reach the Large Medicine. [E1] Avoid the arrow and sneak past those sawblades. [F1] Two sawblades and a flame spurter. The top-left button opens the left door, and the bottom-right button opens the bottom door. [F2] Take out the Search Robos and Golem to open the door. [G2] That top left teleporter just takes you to the bottom door, which won't open until you follow those other teleporters and hit the switch. Long and boring. [G3] Top left switch opens the door, top right disables left spikes, bottom left disables right, and right disables middle. Use Sibaloon. [G4] Bullet statues and a slow moving sawblade, combined with tight spaces. Alternate between Sibaloon and Ceedrun to cross the gaps and protect yourself from the bullets if necessary, and blast that right wall. [H4] Stomp that top switch to open the door. [H3] The top right switch disables the left spikes, the top left disables the middle. Get the FireUp. [G5] Destroy the four block bots to open the door. [F5] Wipe out the Nuu generators and robot to open the door. [F6] Walk past the flame spurters and hit the switch to open the door, and then follow the teleporters to the door. [E6] The middle button disables the bottom spikes, the bottom left disables the top spikes, and the top-left and middle-left disable the left spikes. Blast that bottom wall. [E7] The top-right disables some bottom spikes, the bottom-right disables the top, the top-left most of the bottom, and the bottom-left finishes the job. The middle switch opens the door. [D7] The bottom switches disables the higher spikes and vice versa. Get the BombUp. [D6] Wipe out the Gashin and Crawlers to open the door. [D5] Open the door with the switch, and be careful of the flame spurters and landmines. [E5] Disable the spikes and open the door with that bottom right switch. [E4] Wipe out the Mechadoms. [D4] That's the entrance to the final boss. [C4] Dispose of the Gashins. [C3] Disable the spikes and get the Large Medicine. That top right switch unlocks the door. [E3] The left switch opens the right door and the top opens the higher door. Landmines, spikes and blocks to look out for. [F3] Throw a bomb at the switch to disable the spikes, then step on the other to open the door. [F4] Disable the spikes, get the Purple Crystal and unlock the door. [E2] Disable the spikes and drop a bomb on those yellow switches. The top opens the left door, the lower opens the bottom. [D2] Disable the spikes and get the Small Medicine. [D3] The final confrontation. First you'll battle Max. Once he comes to his senses, you and Max will fight Brain Bomber. Congratulations, Bomberman Tournament is completed!